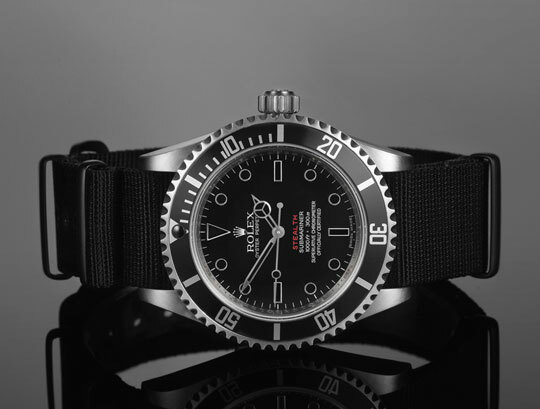 Rolex has long been synonymous with luxury & timeless style, but over the decades the brand failed to capture the kind of allegiance in younger sartorialists as it did in their fathers, so we’re glad to see that Project x Designs have taken it upon themselves to create this stellar update on the classic Submariner. The ‘Stealth MK’ as it’s called takes inspiration from the British military outfit known as the SBS, featuring details like a matte finish, heavy duty nylon strap – which is a brilliant contrast to the luxury of the casing materials – & the removal of the crown guard. Only 24 pieces will be produced, which means they’ll be even more rare than your standard stock Rolex model. More information on ordering can be found here. This entry was posted in Accessories and tagged PROJECT, Rolex, Submariner, timepiece, Watch. Bookmark the permalink.